So you want to make sewing your new hobby, spread your creative wings occasionally and sew something individual and different, deck out your home with original decorations, or alter the odd garment when the need arises? What’s more, you place a high value on quality. Then the Activa 215 is the right choice for you! Highest quality for a low price tag! The CB hook system ensures perfect stitch quality and thread tension,and is easy to clean. With the 11 most important stitch types and a manual multistep buttonhole, the B 215 Simply Red meets all your basic requirements. he powerful motor (900 stitches per minute) boasts high needle penetration power, so you can also sew thick and multi-layered fabrics. 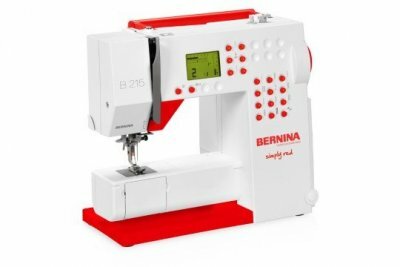 The B 215 Simply Red is well equiped with sewing tools, including 5 presser foot soles, and grows to keep pace with your skills. You can individually upgrade the basic model with a wide range of special accessories, thereby expanding your sewing options.